Want to learn more about the WV-WMD Synod? Looking for resources and information? Throughout Lent, we've posting short readings for Lent on the Synod facebook page. In keeping with Lent, we've kept it straight text, except on Sundays, when we do some visual art. Laetare (and its week), however, gives a chance to ease the Lenten discipline. So, it has been music all week. Check out an amazing setting of the Ave Verum Corpus, the beautiful O Come Quickly, a bluesy guitar setting of Donne's A Hymn to God the Father, and more. You can reach the Synod facebook page at https://www.facebook.com/WVWMDSynod/. Scroll through the days to enjoy samplings of poetry, prose, and maybe even some music or film related to the Lenten season. The Continuing Resolutions of the West Virginia-Western Maryland Synod has been updated with the addition of three new CRs. You can download our governing documents by entering through the Member Portal. Click the big blue button above right. Camp Luther's registration form for Camp Luther 2019 is now available. Visit Camp Luther's website to download you camper's form. The public input phase for the nominations process for positions to be elected at Churchwide Assembly is now closed. Please pray for the Nominations Committee as they continue their work. To review the position descriptions and eligibility criteria, visit the Nominations Committee page. Look under the Member Portal for a link to the latest Synod Assembly 2019 information. Deadline for submission of parochial reports was February 15. That said, we really want them (even if they are late). Please, please, please---we're begging you---complete your parochial report as soon as possible. More information (including on-line access links) can be found on the Congregations Page. 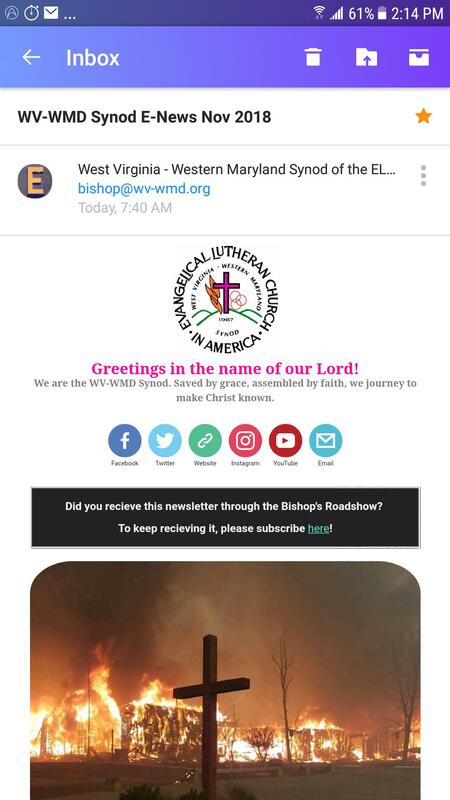 A WV-WMD synod newsletter is now being published electronically. The first issue came out in October. The newsletter will work on a free subscription basis. What does that mean? It costs the reader nothing, but the reader does have to subscribe. Subscribers will receive the newsletter by email. To subscribe, click here. Flood recovery is a long and and difficult process. Community Lutheran Partners, Inc. is in it for the long haul. To give through Community Lutheran Partners visit at http://www.clp-online.org/. Also, visit its website to learn about volunteer opportunities. Disaster response teams should coordinate with Sherri Schafer at Community Lutheran Partners prior to making plans to enter the affected area.